We were still jazzed (and exhausted) from our incredible encounter with the leatherback sea turtle giving birth the night before when our driver/guide Oris picked us up at Rosalie Bay Resort for another day of adventure in Dominica. After yet another hour-long drive, we made it to Cabrits National Park on the island’s northwest coast to see Fort Shirley, one of Dominica’s most important historical sites. 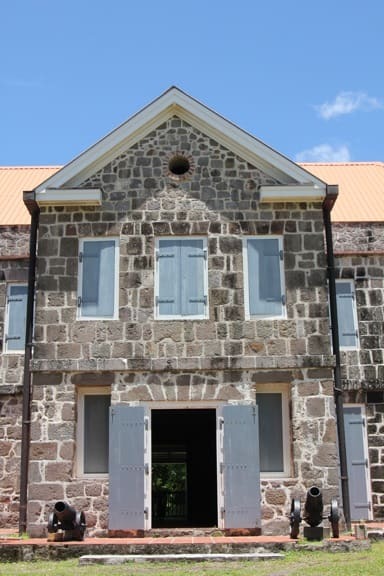 The fort was once the headquarters and main defense post of the British army garrison at the Cabrits, and is currently in the midst of a 6-year renovation project that began after more than 150 years of falling to ruin. The renovation, which was funded by the European Union Eco-Tourism Development Project, has been led by historian and anthropologist Dr. Lennox Honychurch. Under his guidance they’ve completely rebuilt the fort from the original plans, including the classic Georgian architecture of the Officer’s Quarters. 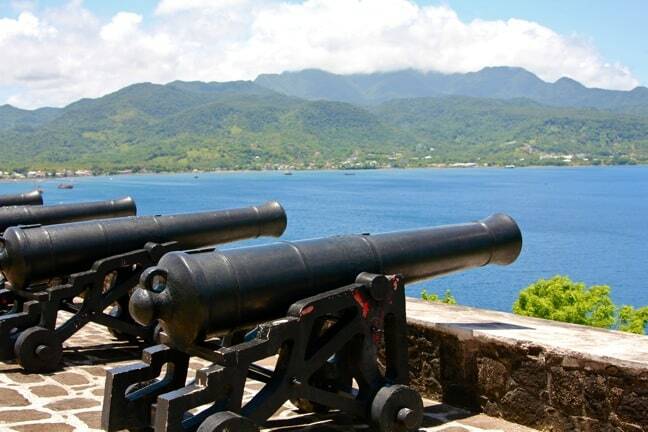 The original fortification began after the Treaty of Paris ceded Dominica to Britain in 1763. 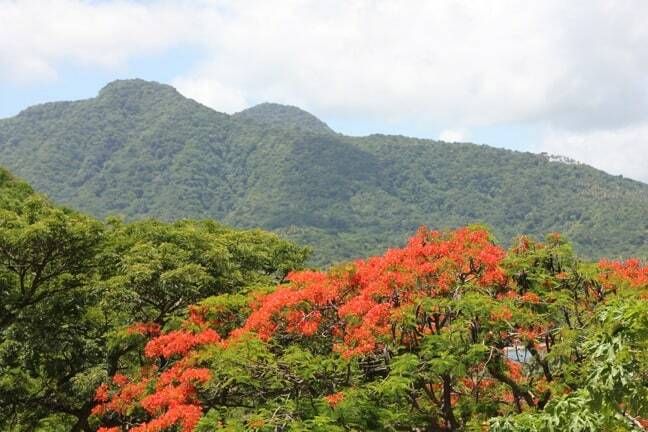 The most important naval battle in the Caribbean, 1782’s Battle of the Saints, was fought within sight of the ramparts, and Fort Shirley was the site of the famous revolt of the 8th West India Regiment in 1802. Honychurch and company have completed restored the fort’s Upper and Lower Batteries, placing 14 antique cannons along the ramparts pointing out across Prince Rupert’s Bay. The guns include different sizes and types of mortars, carronades, a 12-pounder cannon and a larger 32-pounder cannon. The historical site also includes a loop trail that leads visitors around the main buildings– some of which were still being rebuilt when we visited– including military barracks (which once housed 600 soldiers), parade grounds, the Douglas Bay Battery, the Commandants House and ruins of an unusual Octagon House. Aside from the fort, Cabrits National Park also features a small but informative historical museum, walking trails (the Waitkubuli National Trail ends here) through the dry forest of the Cabrits Peninsula, spectacular views of the surrounding countryside, and a 1053-acre marine conservation area that includes the rich coral reef of Douglas Bay, more than 100 species of fish, four different kinds of whales (including Pilot Whales, Humpbacks and Sperm Whales) and three different kinds of dolphins. After a few hours at the park the brutal midday sun really began taking its toll, so we loaded back into the car and made the short drive to the nearby town of Portsmouth for lunch. 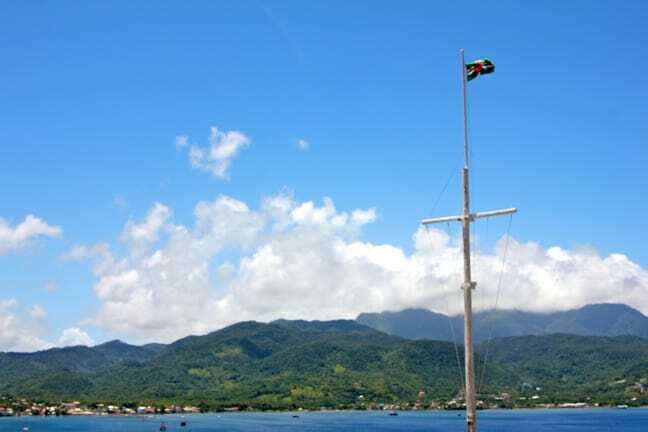 Portsmouth was originally the capital of Dominica in 1760, but after malaria broke out that year the capital was moved to Roseau, where it remains today. 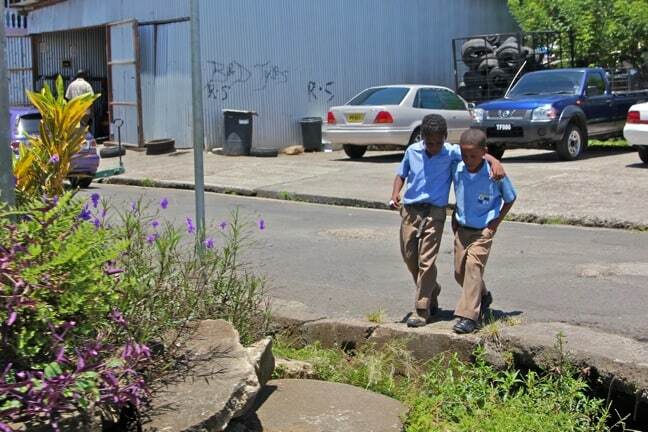 Now, Portsmouth (which has around 3,000 residents) is best known for the nearby Ross University School of Medicine, whose students give the area a laid-back Caribbean college town feel. We saw these two chums walking together as we made our way to the restaurant, and they looked so adorable I couldn’t resist the candid shot. One of the things we don’t like about press trips is that you tend to do a lot of dining at resorts, or at fancy restaurants typically influenced a lot by American or European tastes. As devout lovers of global culture, we’re always seeking out more local flavors, so we were thankful when Oris took us to this tiny cafe in Portsmouth (whose name we unfortunately misplaced) for lunch. There was no menu, just cafeteria-style service of stewed chicken and fish, rice and beans, and simply prepared root vegetables (including the delicious breadfruit). I ordered one of everything, ate every last bite, and finished up Mary’s leftovers as well. Needless to say, it was delicious! 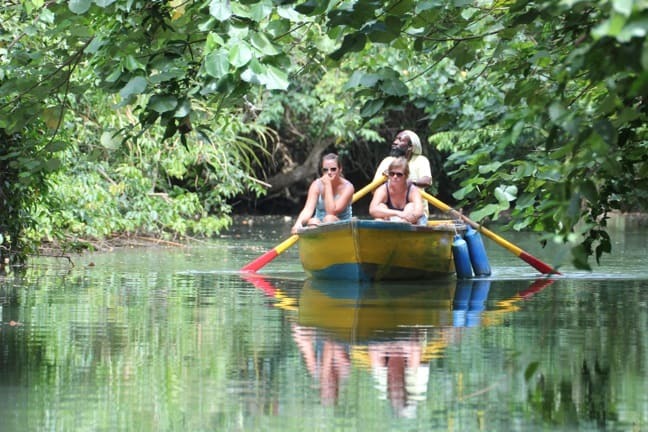 By far our favorite activity of the day was a guided tour of the Indian River, a brackish water (a mix of fresh and saltwater) estuary that stretches from Portsmouth into Morne Diablotins, the highest mountain in Dominica. Because the area is a protected wildlife sanctuary, you have to hire a guide to take you up the river in a paddle boat, as there are no motors whatsoever allowed. 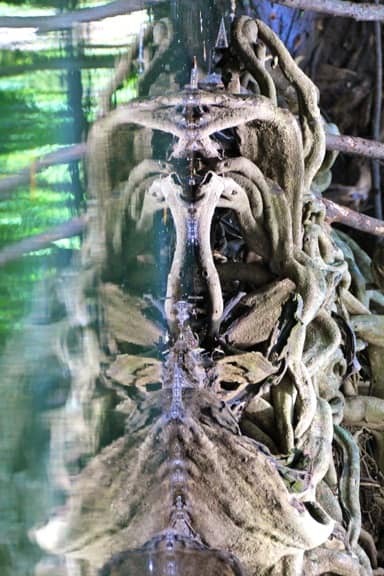 The result is a peaceful, scenic ride into an incredible, otherworldly jungle filled with mangroves and wetlands, which was actually the filming location for scenes from Pirates of The Caribbean: Dead Man’s Chest. 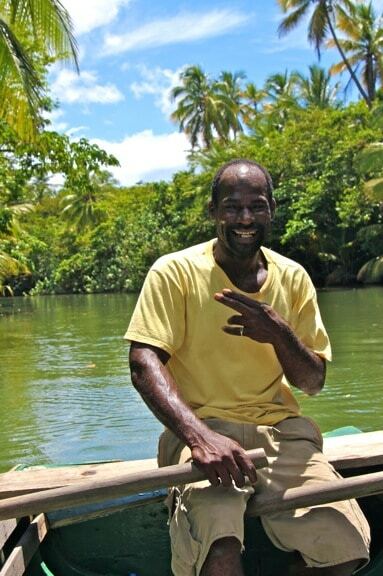 But I’ve got nothing on our Indian River tour guide, a remarkably colorful character known by the nickname James Bond. James, as he liked to tell it, was given this nickname by none other than Johnny Depp, whom James had the pleasure of escorting up the river during filming and who subsequently requested to ride with James every time thereafter. Though I have no way of verifying whether the story is true, I have met Johnny Depp several times in my career as a journalist, and I can assure you that James Bond is definitely the sort of madcap dynamo with whom Johnny would probably love to share a drink and some laughs. James may very well be my favorite tour guide ever. When he wasn’t telling us stories about his life, he was responding to other tour guides shouting out “James Bond!” affectionately or telling us about the area’s copious nature and wildlife. 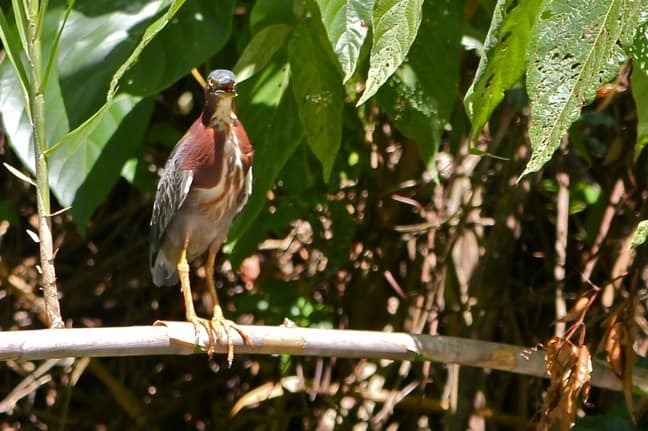 We shared a similar sense of humor, laughing about how the Green Heron is not actually green at all; and a similar love of reggae music (when I made a reference to Third World’s classic song “(1865) 96 Degrees In The Shade,” he immediately burst into song). Long story short, I don’t think Mary or I stopped smiling the entire time. The impressive scenery on all sides didn’t hurt at all. We’ve kayaked through quite a few mangrove swamps before (Sanibel Island‘s Tarpon Bay is a favorite), but I’ve never seen one with the glass-like stillness of the Indian River. I became fascinated with photographing the near-perfect reflections, and made a game out of looking for hidden images within them. This one somehow reminded me on Yosemite Sam, with the huge mustache, mouth, eyes and bushy eyebrows clearly visible. We must have been on the water around two hours, but rarely saw any other tourists– just one other boat on our way in, and another on our way out. The area was almost completely silent other than the occasional bird or crab and James’ slow paddling. If it hadn’t been so hot (it was around 2-3PM by this time), we would’ve gladly spent the whole afternoon out there. James was also great about getting the boat into the best possible position for photography, giving us a chance to try out our brand spankin’ new 500 mm zoom lens. 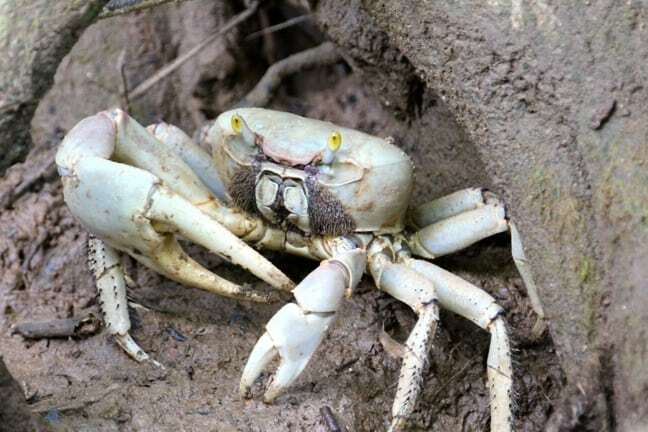 There were tons of Ghost Crabs on the river banks, but most of them were either hidden in the shadows or zipped into their hidey-holes anytime we got within the distance needed to get a killer close-up. But this handsome devil almost appeared to rise to the challenge, holding up his big claw as if he was ready to give us the business if we dared come any closer. Luckily, thanks to the new lens, we didn’t need to! 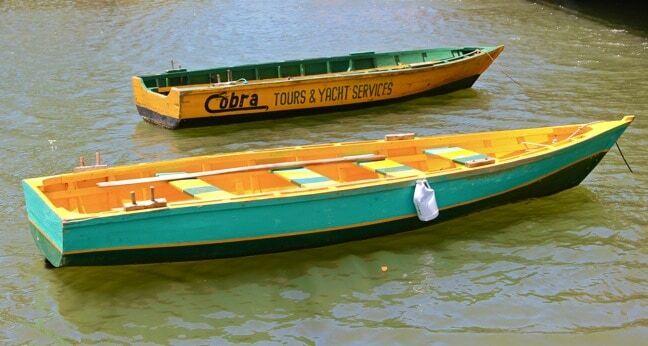 When you get as far back as you can go on the river, there’s a dock where you can get out and visit a covered bar that serves snacks and a variety of delicious tropical beverages (try the Mango smoothie with a shot of rum!). 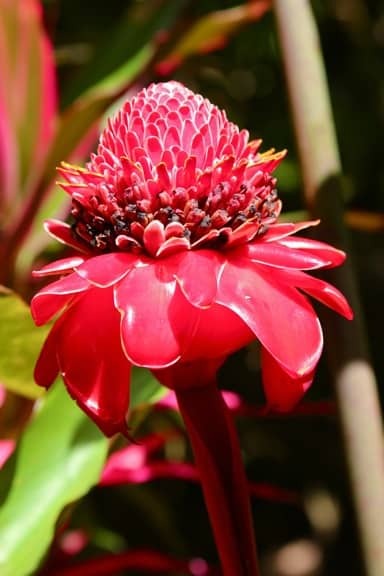 There’s also a well-tended garden containing colorful tropical flowerssuch as Bird of Paradise, Red Torch Ginger and Hibiscus, as well as a few short hiking trails through the forest. Crabs, lizards and birds such as Great Egrets were all around us, giving the area a decidedly Eden-like appeal. 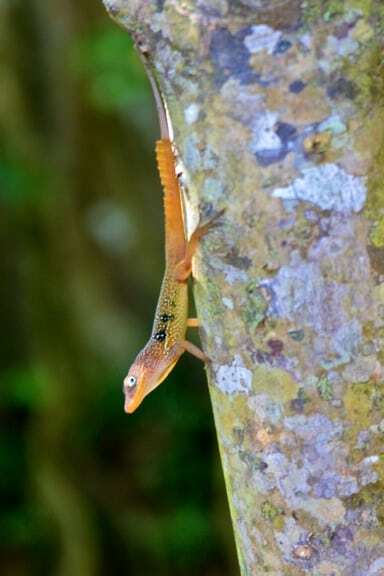 For some reason, unlike the lizards we’d seen at the resort and other places we’d visited, the lizards around the Indian River Bar seemed very inquisitive. This vibrantly colored fella let us get within a foot or two without running away, allowing us to use our Macro lens to capture the tiny details of the pattern on his 3/5-inch body. With the yellow lines around his mouth, he almost looked as if he was smiling. When we finished exploring, we came back to the bar to find that James had made the lovely Mary a beautiful souvenir. He fashioned a tiny hummingbird and fish (both of which we’d seen on our tour) out of palm fronds, then attached them to a stick with a yellow hibiscus flower on the end. 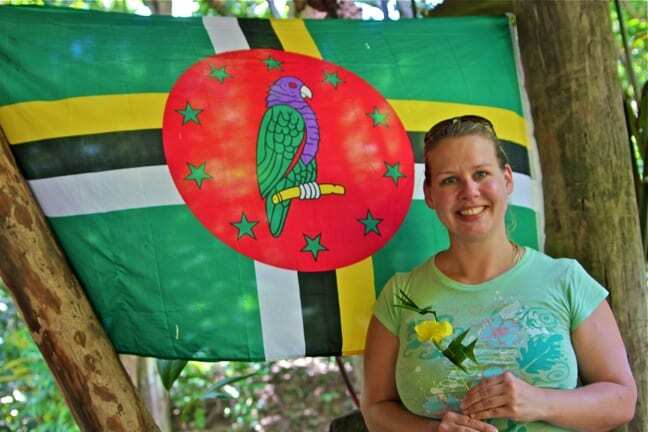 Mary seemed genuinely touched, grinning broadly, so I made her pose next to the bar’s awesome Dominican Flag. I love how all the colors match so perfectly. Ain’t she purty? Soon it was time to go, as we knew it would be another hour-long drive back to Rosalie Bay. Even James seemed more subdued, as the peaceful serenity of our surroundings practically commanded reverence. 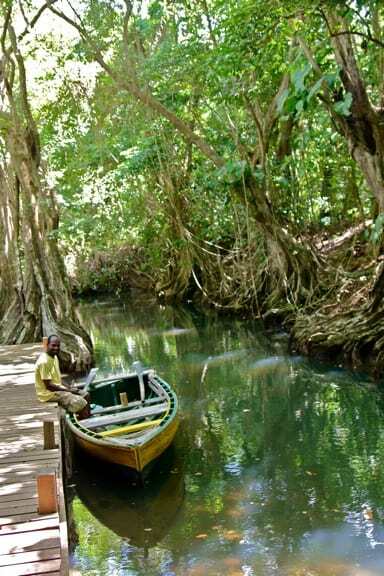 The Indian River was totally unique amongst our Dominican tours, and honestly unlike any other river we’ve ever explored.